One of the better meals (for me, at least) in Epcot's World Showcase is a pizza pie in the Italy pavilion at Via Napoli. We've dined there a few times and I've always enjoyed the meal and the show. The show, you ask? Yeah....the show. In this case, the show is the open kitchen where the pizzaiolos stretch the dough, dress their skins and get them in and out of the ovens. Like a kid in the Marshall Field's windows at Christmastime, I press my nose against the glass and stare at them assembling and baking the pies for everyone. Nat will tell you that this isn't an uncommon sighting; just about every pizza place that we go to that has an open kitchen/oven, I'll find time to watch the goings ons. On this visit to Via Napoli, I was drawn to the cheese bins and the labels that they had applied to them. The photos you see here are taken from my perspective, so that's why the labels appear upside down. 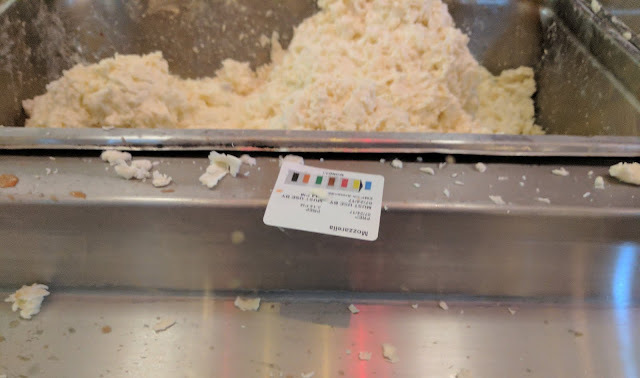 Above, you'll see the mozzarella station - which was the biggest bin. They're using low-moisture mozzarella for the most part, which I can support even though this is a neapolitan joint. But the other cheese bins are just as interesting. Take a close look (click the photos and they'll get bigger) and you'll see Robiola, Parmesan, Provolone and Fontina. 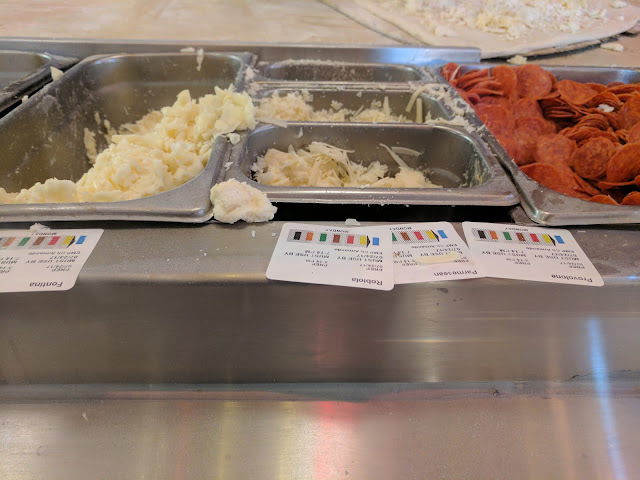 Robiola is a cheese I'm totally unfamiliar with, so it is something worth investigating when it comes to pizza making. It is a soft cheese, which I've begun to try to use in the form of a nodini or bocconcini paired with the low-moisture scamorza that is key to the Parr-blend© cheese mix that I top my pies with at home. Looking at the Via Napoli menu, they only use Robiola on one pie: their Broccolini. It has cherry tomatoes, mozzarella, broccolini, porchetta and robiola. Might be something to give a shot? With our Angelo Caputo's in Downers Grove closing (and hearing it is moving to 75th Street??? ), I'm left with trips to Pete's Fresh Market in Oak Brook Terrace/Villa Park to pick up my Italian specialty items like cheeses and cured meats. Next time I go, I'll keep an eye out for Robiola. Not to mention broccolini, amirite?! ?